A lazy Sunday morning always wants me to hunt for easy recipes for breakfast. Here is one that I found online that was not only easy to make but very very very yummy. 1) In a large mixing bowl, add 2 Cups of Maida (All Purpose Flour, 1 Cup Mik (Make sure you have had already boiled it once and cooled), 2 Tablespoons of Rice Flour, Salt per Taste and Water as needed. 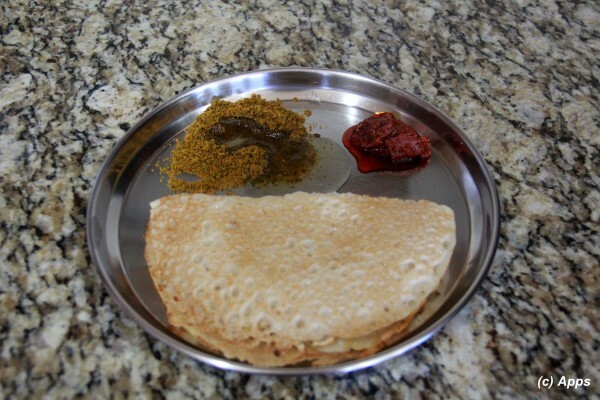 2) Mix all the ingredients into thin batter enough to make a Dosa. It should not be too runny or too thick. 3) Heat a pan and rub it with little oil. Pour approx 1 1/2 ladle of the batter. 4) Cook on both sides. 5) Serve with Chutney, Chutney Powder, Sambar or Pickle.